While enlarged male breasts may not cause significant physical discomfort for men, it can cause emotional discomfort. In some cases, it can lead men to avoid certain social situations like going the beach, decreasing their quality of life. Male breast reduction surgery can help restore patients’ confidence, thereby, restoring quality of life. 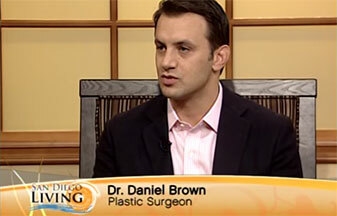 Dr. Daniel Brown is one of the top Southern California plastic surgeons performing male breast reduction surgery. Patients interested in the procedure can contact one of our convenient locations in La Jolla, Coronado, or Del Mar to request a consultation. Gynecomastia surgery, also called male breast reduction surgery or reduction mammaplasty, is a procedure designed to address gynecomastia by removing excess tissue from the male breasts. The procedure flattens and enhances the contour of the chest. In more severe cases, it can also be performed in order to reposition and resize the areola if it has started to stretch or sag. 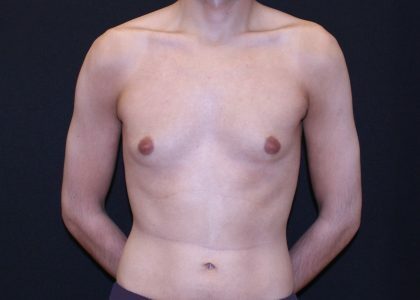 Gynecomastia refers to male breasts that are overdeveloped or enlarged. This can occur to men at any age and due to a variety of reasons, including hormonal changes, heredity, weight fluctuation, or drug use. Patients suffering from gynecomastia may exhibit one or more of the following signs: excess glandular tissue, excess localized fat, or excess breast skin. These symptoms may occur unilaterally (in just one breast) or bilaterally (in both breasts). Men concerned about the appearance of their chest should contact us today to request a consultation. Healthy individuals experiencing the symptoms of gynecomastia may benefit from male breast reduction surgery. They should have already tried to correct the contour through eating healthy and exercising. Dr. Brown also recommends that the patient’s breast development is stabilized, which means that adolescents may not be good candidates. This is because more adipose or glandular tissue may grow after surgery due to puberty. However, Dr. Brown asks all patients interested in the procedure to contact his office and request a consultation to determine candidacy. Patients shouldn’t have any chronic illnesses that could impair their ability to heal properly. Furthermore, they should not use drugs or drink heavily. During the consultation, the patient should inform Dr. Brown of any medications that the patient takes, so he can ensure the patient’s health and safety during the procedure and recovery. Men preparing for gynecomastia surgery must be mentally healthy as well. This means that they should have a positive outlook and specific and realistic goals. Dr. Brown recommends that patients interested in the surgery take a look at some of Dr. Brown’s male breast reduction surgery before and after photographs, but please keep in mind that results vary for each individual. In order to find out if you would benefit from male breast reduction surgery, contact our La Jolla, Coronado, or Del Mar office to request a consultation. Reduction mammaplasty may require intravenous sedation, general anesthesia, or a combination of both. Dr. Brown will help the patient make the decision on what anesthetic will be best for them. Following anesthesia, the doctor will either perform liposuction, excision, or a combination of both techniques depending on the cause of the male breast enlargement. If gynecomastia is primarily a result of excess fatty tissue in the breasts, then Dr. Brown may be able to meet the patient’s goals only using liposuction. The doctor performs contour liposuction using suction-assisted liposuction, power-assisted liposuction, laser-assisted liposuction, or ultrasound-assisted liposuction. With this method, a small incision will be made in a discreet location near the localized fat deposits, usually around the areola for camouflage. Then, a cannula – a small, hollow tube – will be inserted through the incision and the excess fatty deposits will be removed. The excision technique will be utilized when the patient has excess glandular breast tissue in their breasts similar to women. 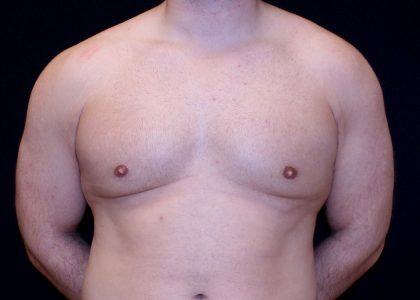 This technique will be able to sufficiently treat more severe examples of gynecomastia, including areolas that need to be resized or repositioned. With the excision technique, Dr. Brown will make discreet incisions around the breasts or areolas. Through these incisions, the doctor will remove excess tissue and skin and, if necessary, resize and reposition the areolas. He will then close the incisions. Immediately following the procedure, the patient’s chest will be bandaged and wrapped. They will also likely be placed in a compression garment that will help minimize bleeding, swelling, and bruising and help the body settle into its new contour. In some cases, a small, thin tube and plastic drain may be placed underneath the bandages to drain excess fluid and promote healing. Prior to going home, patients will be instructed on how to change their post-surgical garments. They will also be provided with prescriptions for pain medication to help with discomfort, which should be filled in advance of the surgery day. Patients should expect to return home on the same day as the surgery but should make arrangements for somebody else to drive them home as they will not be able to drive themselves. Also, prior to being released, patients will be provided with a personalized timeline for when they can resume particular activities, including returning to work, resuming strenuous exercise, or lifting heavy objects. Patients will also be asked to return for follow-up visits with Dr. Brown so that he can ensure that the patient is healing properly and achieving the best possible results. The most serious side effects of gynecomastia surgery, although not normal, include chest pains, shortness of breath, and irregular heartbeat. If the patient experiences any of these uncommon side effects, then they should seek medical assistance. Dr. Brown is also on-call in order to assist with any patient concerns. In order to minimize the risk of any serious side effects, patients should be sure to follow the doctor’s orders. Patients should also be sure to have another responsible adult on-hand following surgery to assist if need be. Patients can improve the appearance of their scars by staying out of direct sunlight and apply sunblock and moisturizer. Results from gynecomastia surgery should be immediately evident. Patients will notice reduced volume in their breasts, but final results will not be evident until the patient has fully recovered. Swelling, bruising, and bleeding – the most common side effects – will dissipate, allowing the patient to then enjoy their long-lasting sculpted results. The patient’s satisfaction with their results will continue to grow over time. Furthermore, the incision marks from surgery will continue to fade over time. Plastic surgery for men is on the rapid rise, not just in southern California, but globally. More and more men are choosing to enhance their appearance, finding that it gives them a leg up socially, at work, and improves their self-confidence. Besides gynecomastia, Dr. Brown’s male patients may want to consider some of the other treatments we offer. Contour Liposuction: Besides in the chest, patients may possess localized fat deposits in other parts of their body – such as the neck, abdomen, flanks, or thighs – that aren’t responding to diet and exercise. Contour liposuction can help slim the body for improved contour and overall sculpting. Tummy tuck: Many men come in for tummy tucks due to lax abdominal skin from weight loss. It is commonly combined with gynecomastia for a uniformly defined midsection. Facelift: The facelift is a common facial procedure for men looking to improve the overall contour and appearance of the face. The consultation is the first step in beginning the journey towards a more confident, happier self. During the consultation, Dr. Brown will meet one-on-one with the patient to discuss how he can help the patient meet their goals. The first step will involve discussing the patient’s goals for surgery and what their ideal outcome will be. Following this discussion, the doctor will perform a physical examination to determine the best course of action to meet the patient’s goals. Dr. Brown will use his expertise in order to determine the best treatment option for the patient’s body and that will help the patient meet their goals. He may recommend the liposuction technique, excision technique, or a combination of both. During the consultation, Dr. Brown encourages patients to ask any questions they have about the male breast reduction procedure or any other procedures they may be interested in. Dr. Brown is happy to answer all plastic surgery related questions and hopes that the patient leaves the consultation feeling as informed about their options as possible. The cost of gynecomastia surgery varies widely based on many different factors that will be discussed during the consultation. Following the consultation, once the doctor has had the opportunity to analyze the patient’s specific case, he will be able to provide the patient with an accurate quote. Most insurance companies will not cover male breast reduction surgery, as it is an elective procedure. However, there are financing options available, which can also be discussed at the consultation. In order to get started with your gynecomastia procedure and enhance your quality of life, contact one of the offices of Dr. Brown near San Diego to request a consultation.